Nestled amid 15 acres of lush tropical gardens, Waterfall Ristorante Italiano offers authentic and unique Southern Italian cuisine that combines the freshest seafood and handmade pastas from chef Daniele Devillanova. 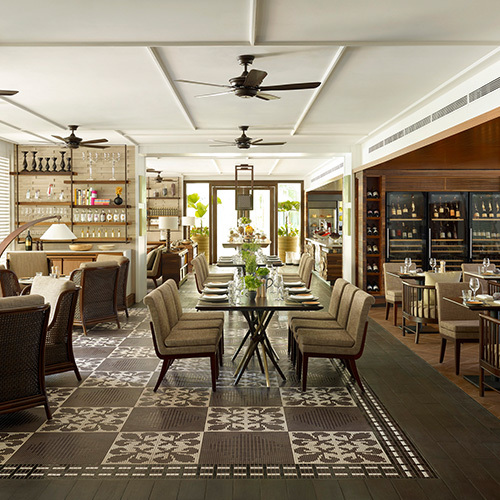 Within the eclectic colonial interiors of the restaurant lies a treasure trove of fresh seasonal produce. The restaurant’s wine list is unlike any other. Choose from an extensive collection of wines to embark on a tasting journey spanning Italy. Savour Waterfall’s house wine, Nero d’Avola, which is made from the most important red wine grape in Sicily, in the unique Boccalino. Indulge in an extensive collection of sherries and grappas. For coffee lovers, baristas are trained to pull the perfect shot of illy brew throughout the day. In addition, an exclusive private dining room fitted with a show kitchen serves as the ideal venue for cosy dinner parties, informal gatherings or culinary workshops.